You don’t have to take an 8 hour flight from JFK to Munich to find fine, authentic Bavarian dining. All you have to do is find your way to Zum Stammtisch in the Glendale neighborhood of Queens (Take the L train to Myrtle-Wyckoff and then the Q55 bus). You might have heard of Zum Stammtisch; it has received high marks from the likes of Zagat and Time Out Magazine. A word of caution: a reservation is necessary on weekends and even some weekday nights. Note that they do not reserve tables for parties under 3, so if you’re visiting Zum Stammtisch with your sweetheart, be prepared for a wait. Though to be honest, it’s worth it. The restaurant has a very authentic, cozy aesthetic based on a Bavarian inn. The interior is complete with dark, wooden booths and chairs, low lighting, the heads of game mounted on the wall, and all kinds of charming German trinkets. The place is frequented by the locals, many of whom speak German. The place is an experience, and by the time you stumble back out into Queens, your belly full of Hefe-Weissbier and delicious Bavarian food, you might have forgotten you’re in New York City (or the US for that matter). Die-hard German soccer fans rejoice: a ticker displays the latest scores and standings from the Bundesliga and the bar features all kinds of German soccer memorabilia, including a signed jersey from the ’06 WM Nationalmannschaft. I am by no means a food critic, but I had high expectations for this restaurant. I ordered the Leberkaese because the last time I had the opportunity to order Leberkaese was in Garmisch-Partenkirchen, a Bavarian city nestled in the Alps. That meal was amazing and I was definitely looking forward to a repeat. Leberkaese literally means “liver-cheese”, and that may not sound very appealing to you. I’ll admit, I didn’t even really know what it was (I had to look it up for this article). It turns out it’s something like corned beef, onion, bacon, and pork all mixed together, ground very fine, and then baked in a bread pan. It really does look like a slice of bread, too. It’s topped off with a fried egg. So how did Zum Stammtisch stack up to my meal in the Alps? It didn’t disappoint one ounce. The long wait and corresponding hunger contributed, but it was really delicious. I love the consistency of Leberkaese: you can cut it with the side of your fork like butter. 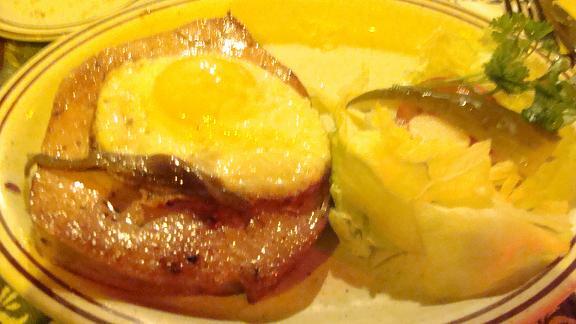 And I love the way the yolk of the egg breaks and runs over the meat. Amazing. I also had a 1L Hofbraeu that left me feeling quite nice. My girlfriend had the Jaegerschnitzel. Her description: “Very yummy and tender but heavy on the gravy. Lots of mushrooms” and “Plain and simple potatoes but soft and yummy.” There you have it folks. Later, I ate her leftovers and I agree with her assessment. 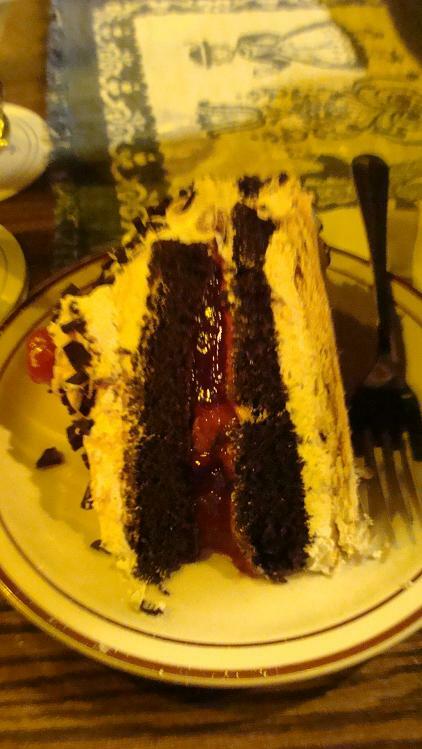 For dessert we had the best Schwarzwaelder Kirschtorte (Black Forest Cherry Cake) I’ve ever tasted. It was heavenly. Seriously, if they hadn’t seated us in the middle of the restaurant, I would have licked the crumbs off the plate. For a college student, Zum Stammtisch is a little rough on the wallet, but not unreasonably priced for a special meal. For example, for two dinners with a beer and a soda, and a piece of cake, we spent around 65 dollars. But it’s worth it: big portions and big taste, plus a great atmosphere. Overall, a very memorable night. This entry was posted in Uncategorized and tagged Beer, Food, German, Germany, Glendale, Queens, Restaurants, Zum Stammtisch. Bookmark the permalink.